Philadelphia Eagles head coach Doug Pederson celebrates after beating the Minnesota Vikings in the NFC Championship. After he called another masterful game on Sunday to help lead the Philadelphia Eagles to their first Super Bowl berth since 2005, the hiring of head coach Doug Pederson just over two years ago is looking like a genius move. The rapid rise of the now-second-year coach, who made his first playoff appearance just last week, makes it easy to forget that many, including a sizable portion of the fan base, were more than skeptical of the team's decision to go with an unproven entity who only eight years prior was coaching a high school team. And while the fan base wasn't entirely sold from the jump, the loudest anti-Pederson noise was coming from the media more than anywhere else. As recently as the beginning of this season, former NFL GM Mike Lombardi said Pederson was "less qualified to coach a team than anyone" he'd seen in his career. 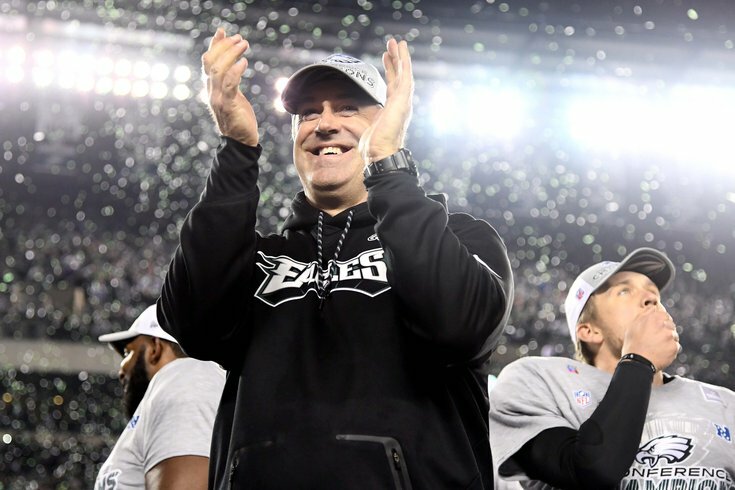 All Pederson's done in the meantime is coach his team to a 13-3 regular season record – while withstanding injuries to Pro Bowl players on both sides of the ball, including Carson Wentz, Jason Pederson, Jordan Hicks, and Darren Sproles – and bring them one win away from the city's first Super Bowl title – after beating the reigning conference champions and NFL MVP in Matt Ryan and the Falcons, and posting 38 points on the NFL's top-ranked defense. Oh, and did we mention those last two wins both came as underdogs? "I think that's what makes it more special with these guys," Pederson said looking back on all his team's overcome this season. "When we started way back in OTAs, you kind of know or knew you might have at least a good team [that] could compete for the NFC East. As the season goes, you start losing some of your top players to injury. You just kind of see the fight in the guys and the resiliency in the guys. Then you lose another player a couple weeks later, and obviously, you lose your quarterback here at the end. "The guys just keep battling, you know? For us to believe in one another and to be now in this spot, I'm just so happy for those guys, and hat's off to them." Perhaps the biggest thing to come from Wentz's season-ending ACL injury was that it allowed the world to see just how good Pederson can be, something that Eagles owner Jeffrey Lurie had apparently known all along. With an MVP candidate at quarterback, it can sometimes become a chicken-and-egg argument about whether the coach is making the quarterback look better than he actually is or the quarterback is making the coach look better. In this case, they might be equally good, and that's a scary proposition for the rest of the NFL, especially after watching the game he called in his team's 38-7 NFC Championship rout of the Minnesota Vikings. “[Pederson] just has such a great feel for the game," said Nick Foles, who was perfect (literally) in the second half and finished with 352 yards passing, three touchdowns and a 141.4 passer rating. "He played quarterback for a long time and he’s coached for a long time. He can feel it, and that’s where keeping a team off balance and knowing what’s working for us provides a rhythm for the offense. Added Foles, "I played for some amazing coaches, and Doug is an unbelievable play-caller. It’s hard to rank them because there have been so many great coaches, but he’s definitely up there." Tight end Zach Ertz agrees. He enjoyed a career year in his second season under Pederson system and compared the offensive coaching staff – namely Pederson, offensive coordinator Frank Reich and QB coach John DeFilippo – to mad scientists of sorts. Pederson's success, however, is about more than just his ability to dial up a flea-flicker at just the right time. It's about "emotional intelligence," a phrase that was laughed off when Lurie dropped it during Pederson's introductory press conference. "I said at the time, I spent a lot of time with players at the end of that season and I thought what was really needed was real – a kind of leadership that leads with a genuineness, a real genuineness," Eagles owner Jeffrey Lurie said Sunday night. "And people laughed when I used the term emotional intelligence, but that’s probably a really good way to describe it and I think in sports today ... there’s many styles – I was just saying to someone else. There’s many styles of great coaches. [Patriots head coach] Bill Belichick, you know, [former NFL head coach] Bill Walsh, [Saints head coach] Sean Payton - the list goes on and on and on – [former Giants head coach] Tom Coughlin. There’s a lot of great coaches. They all have their different styles, but the one common ground amongst them all is absolute consistency and genuineness. "And [Doug Pederson is just himself. And at times, that’s very humble, and at times, it’s just very real. At times, that’s very bright. At times, it’s tough. But he does it in a true genuine way and I think players really respond to that in today’s world." While that "emotional intelligence" may not mean much to the fan base, it certainly means something to the players. “Coach Pederson is an unbelievable coach to play for," Foles said when asked about his post-game embrace with his head coach. "In that moment, he simply was proud of me and proud of us. I’m proud of him because it’s been a journey. This has been a crazy journey this year with everything that has gone on. When you really look at it in detail with all of the obstacles and all of the injuries, it’s a testament to the coaches that we have, all of the people at the NovaCare facility, and all of the players. In that moment it was just an embrace. It was a special win for anyone who bleeds midnight green, as the Eagles will get a chance for some revenge on Tom Brady, Bill Belichick and the New England Patriots. So what was Pederson's message to his players in the locker room? "We're going to the Super Bowl. We're going to the stinking Super Bowl, and that's all we need to know," Pederson said. "I was just so proud of them for the season so far. We still have some unfinished business, obviously. But we're going to pack our bags and head to Minneapolis."